CMLL set up two matches here, and the lesser one will take palce. 5) Boby Zavala, Epydemius, Eterno b Demus 3:16, Dr. Karonte Jr., Fishman Jr.
Electro fouled Cibernetico for the DQ. Zorro was DQed for hitting the ref after a foul – usual LA Park level finish. Those first two matches weren’t on the poster, just more people getting booked. 68 in total. I’m not sure these shows are great for lucha libre – they’re taking value out by booking very possible star and not adding it by increasing interest in anything – but they’re pretty good for getting lots of luchadorrs paid. Taven versus Euforia is a very deep cut by the hat. Maybe Taven saw all those Mistico/Euforia exchanges and really wants to try some tricky headscissors. Micro luchador Gran Nikolai has passed away. He and others pioneered the micro luchador matches in the 70s and 80s, when they were an especially popular special attraction. 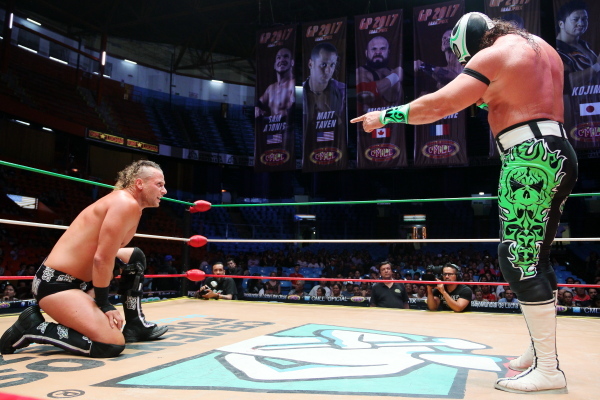 They led both to the modern minis matches and CMLL’s recent resurgence of micro matches. The GFW tapings have had a decent amount of AAA/The Crash/LU involvement. It’s not yet clear if Johnny Mundo (Impact) and Taya are meant to be full timers here; that’ll probably be clearer in the last couple days of tapings. There’s a GFW/AAA midcard feud going on (with Texano, Fantasma and Pagano as Team AAA.) There’s allusions to a GFW tag title match happening in Tijuana, which fits with what was announced with 09/02 The Crash show, but it’s less clear how it fits in as the tapings on. There’s a mention of Eli Drake “still being in Mexico” during the tapings, which might mean some AAA appearances or might mean nothing at all. ESTO has an interview with Los Perros del Mal. There’s a mentioned that Kahn had been talking to Halloween and Mr. Aguila to return to the group for two years – which is odd, because about one year ago, Halloween was in AAA and feuding with Perros del Mal. Like all the other people in Torneo TripleMania XXV, this is probably just a one night deal but it was important for AAA to have Perros del Mal represented. This week’s AAA show is up. Next week’s show airs about 3 hours before the show. 90 minutes spent on totally hyping the show probably wouldn’t be entertaining for those of us who are already planning on watching it but is probably the best use of the time for them. Ultimo Dragon, Jun Akiyama, and Caristico beat Joe Doering, Diamante and Sam Adonis in AJPW’s Lucha Fiesta on 08/19. Salamanca luchador Shiva says he’s happy with his work and effort despite not making the La Llave a La Gloria cut for TripleMania, says he’s appearing in Naucalpan in a couple weeks. More Mexico vs The World. More Diamante Azul, who looks less like a big guy against the foreigners. Semimain rudo side is a little odd but OK. Soberano/Cavernario should be fun, and might be a setup to having the title match as the semimain under the Gran Prix. Might be a case in doing Niebla Roja/Gran Guerrero in a title match if they think they can have a good enough match to talk people into coming back on 09/16. Good news for AAA is they definitely won’t have the least appealing singles match in Mexico City next Saturday. CMLL not accepting that Shocker shouldn’t be in singles matches and putting him with a person unfamiliar with Mexico (who will be in his seventh match in nine days) seems like a recipe for disaster. Morphosis being booked the day after TripleMania is amazing but it’d be surprising if he actually shows up in Arena Mexico. I hope he just strolls it like nothing happened.